Jersey City, NJ – September 28, 2017 – TrialScope, the global leader in clinical trial transparency and compliance solutions, announced new findings from its sponsor survey on clinical trial results sharing practices, at CBI’s second annual Plain Language Summit in Philadelphia. The survey asked sponsors about their current approach to trial results summaries and their plans for sharing summaries in the future. TrialScope’s Chief Strategy Officer, Thomas Wicks, presented highlights of the results in a session titled “How to distribute trial results summaries to patients?” on September 26th. TrialScope simplifies the complexities of clinical trial transparency. TrialScope’s award-winning, proven solutions have been implemented successfully and rigorously tested in the most complex environments and are managing disclosures for sponsors that are responsible for over 35% of industry sponsored clinical trials posted on clinicaltrials.gov. The company’s market-driven solutions and expertise enable sponsors to improve performance, mitigate compliance risk, and ultimately optimize efficiencies with clinical content lifecycle management tools, expertise and processes. TrialScope technologies are offered via a validation-ready SaaS platform hosted in a private cloud. The post TrialScope Tackles Issue of “Sharing Clinical Trial Results with Patients” at CBI Conference; Presents Sponsor Survey Findings appeared first on TrialScope. TrialScope will present a global regulation review on clinical trial disclosure compliance:at a Vivli-sponsored event focusing on GDPR May 13 in Tokyo. Francine Lane, TrialScope Vice President of Global Transparency, has received a 2019 Global Inspire Award for Community Engagement from the Drug Information Association (DIA). TrialScope Chief Strategy Officer Thomas Wicks will participate in the Partners as Patients conference in Philadelphia March 11-12. TrialScope Engage has been named a finalist for Best Patient-Focused Technological Development in the 2019 Clinical & Research Excellence (CARE) awards. TrialScope Chief Strategy Officer Thomas Wicks will present at the ECCRT Data Transparency Conference in Brussels. His topic is “Watchdog Initiative: Keeping Tabs on Transparency Advocates." TrialScpope Chief Strategy Officer Thomas Wicks will present at the 6th annual Clinical Trial Disclosure and Transparency conference Jan. 29-30 in Philadelphia. TrialScope is a sponsor of the event. TrialScope's TrialScope’s Clinical Trial Transparency Service (CTTS), offering dedicated clinical trial websites for sponsors, was named one of PM360’s most innovative healthcare services of 2018. Deborah Collyar and Jennifer Van Ekelenburg spoke at TrialScope's 2018 Strategic Partner Summit, where the Clārus Awards were presented for commitment to clinical trial disclosure and transparency. 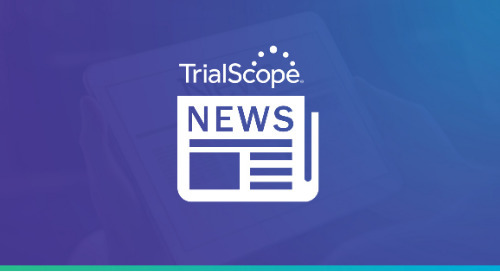 TrialScope has launched a transparency solution enabling clinical trial sponsors to engage with patients, healthcare professionals, researchers and the public via a dedicated informational website. TrialScope's Thomas Wicks and Francine Lane will participate in two sessions at the 2018 Drug Information Association (DIA) Global Clinical Trials Transparency Conference in London Sept. 19-20. © TrialScope Inc. All rights reserved.